There are several general guidelines to follow to successfully search for images. The idea of Visual Search is one of iteratively narrowing down or Zeroing In on images that are closer and closer to your end goal - finding an appropriate image for use. Lets say you have an image catalog of 10,000 images. A text search using keywords or file names might narrow down the collection to 2000 matching images. For most search engines, that is the extent of the filtering process. Now, you would need to page through every page to find an image you can use. (With 16 images to a page that is 125 pages). Since the text engine has no way to search the visual characteristics of image you are interested in, it simply displays the 2000 results in a set order. With eVe and visual search, however, you can continually refine your search until you find the image you want. This iterative search process begins by locating one image (the query image) that is somehow similar to what you are looking for . Generally you find this first query image using a text search, visually scanning the first few results for an image of interest. You then select this image as your query image and run a visual search. From this new set of search results you again select the image which most closely resembles what you ultimately want. This becomes the new query image and you perform another visual search. You continue this narrowing down process until you find the image you want. Object selection or Partial Image Search gives you an additional tool to refine your search. With Partial Image Search you can click on an object within an image and ask the search engine to find other images with that object in it. Choosing optimal visual search techniques has to do with what the image looks like (clarity and cleanliness), and the make up of the image itself. Much of the determination can come from looking at the image or at its object map. It lets you see if how the computer sees the image. Does it see a well defined image with distinct objects, or a more irregular pattern? 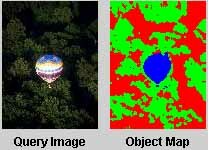 The object map shows that the computer sees a balloon object, some tree objects and some deep shadow objects. Color Color will select other images with similar color distributions, or with a major proportion of the color of the main (or selected) item in the image. Use color when looking for images with a similar color to the target image, or to the selected object in the query image. Each of these images has a very unique texture. The more complex the image, the better to use Texture if you are looking for similarly complex images. The object map shows that there is no really distinct image, but the overall feel for the image can be seen in the texture of it. This is a classic image for a texture based search criteria,. There is no item at all, but simply a close up of something, where the object map shows a very complex texture structure across the entire image. Region Region will select images based on a combination of color, texture and shape of the main (or selected) objects in the image (essentially it is a 3D representation of the 2D image). Use region for more complex images with distinct objects. The image is relatively distinct in the object map, but it is complex. You can of course mix and match these criteria and assign different importance levels to each attribute. Note: If there is a particular object in the image that they you looking for (as opposed to finding another image similar to the entire query image), you should also try the above steps after having selected the specific object using the object map.